This article is about the concept. For the buildings used in Christian worship, see Church (building). For an individual church, see Church (congregation). For discussion of organization and relationships between individual churches, see Christian denomination. For other uses, see Christian Church (disambiguation). "Christian Church" is an ecclesiological term generally used by Protestants to refer to the whole group of people belonging to Christianity throughout the history of Christianity. In this understanding, "Christian Church" does not refer to a particular Christian denomination but to the "body" of all "believers", both defined in various ways. Other Christian traditions, however, believe that the term "Christian Church" or "Church" applies only to a specific concrete historic Christian institution, e.g. the Catholic Church, the Eastern Orthodox Church, the Oriental Orthodox Churches, or the Assyrian Church of the East). The Four Marks of the Church first expressed in the Nicene Creed are that the Church is One (a unified Body of Particular Churches in full communion of doctrines and faith with each other), Holy (a sanctified and deified Body), Catholic (Universal and containing the fullness of Truth in itself), and Apostolic (its hierarchy, doctrines, and faith can be traced back to the Apostles). Thus, the majority of Christians globally (particularly of the apostolic churches listed above, as well as some Anglo-Catholics) consider the Christian Church as a visible and institutional "societas perfecta" enlivened with supernatural grace, while Protestants generally understand the Church to be an invisible reality not identifiable with any specific earthly institution, denomination, or network of affiliated churches. Others equate the Church with particular groups that share certain essential elements of doctrine and practice, though divided on other points of doctrine and government (such as the branch theory as taught by some Anglicans). Most English translations of the New Testament generally use the word "church" as a translation of the Ancient Greek: ἐκκλησία, translit. ecclesia, found in the original Greek texts, which generally meant an "assembly". This term appears in two verses of the Gospel of Matthew, 24 verses of the Acts of the Apostles, 58 verses of the Pauline epistles (including the earliest instances of its use in relation to a Christian body), two verses of the Letter to the Hebrews, one verse of the Epistle of James, three verses of the Third Epistle of John, and 19 verses of the Book of Revelation. In total, ἐκκλησία appears in the New Testament text 114 times, although not every instance is a technical reference to the church. In the New Testament, the term ἐκκλησία is used for local communities as well as in a universal sense to mean all believers. Traditionally, only orthodox believers are considered part of the true church, but convictions of what is orthodox have long varied, as many churches (not only the ones officially using the term "Orthodox" in their names) consider themselves to be orthodox and other Christians to be heterodox. The Greek word ekklēsia, literally "called out" or "called forth" and commonly used to indicate a group of individuals called to gather for some function, in particular an assembly of the citizens of a city, as in Acts 19:32-41, is the New Testament term referring to the Christian Church (either a particular local group or the whole body of the faithful). In the Septuagint, the Greek word "ἐκκλησία" is used to translate the Hebrew "קהל" (qahal). Most Romance and Celtic languages use derivations of this word, either inherited or borrowed from the Latin form ecclesia. The English language word "church" is from the Old English word cirice, derived from West Germanic *kirika, which in turn comes from the Greek κυριακή kuriakē, meaning "of the Lord" (possessive form of κύριος kurios "ruler" or "lord"). Kuriakē in the sense of "church" is most likely a shortening of κυριακὴ οἰκία kuriakē oikia ("house of the Lord") or ἐκκλησία κυριακή ekklēsia kuriakē ("congregation of the Lord"). Christian churches were sometimes called κυριακόν kuriakon (adjective meaning "of the Lord") in Greek starting in the 4th century, but ekklēsia and βασιλική basilikē were more common. The word is one of many direct Greek-to-Germanic loans of Christian terminology, via the Goths. 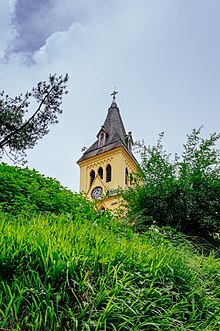 The Slavic terms for "church" (Old Church Slavonic црькꙑ [crĭky], Russian церковь [cerkov’], Slovenian cerkev) are via the Old High German cognate chirihha. An Eastern icon depicting the Descent of the Holy Spirit. The date of Pentecost is considered the "Birthday of the Church". The Christian Church originated in Roman Judea in the first century AD, founded on the teachings of Jesus of Nazareth, who first gathered disciples. Those disciples later became known as "Christians"; according to Scripture, Jesus commanded them to spread his teachings to all the world. For most Christians, the holiday of Pentecost (an event that occurred after Jesus' ascension to Heaven) represents the birthday of the Church, signified by the descent of the Holy Spirit on gathered disciples. [Acts 2] The leadership of the Christian Church began with the apostles. Springing out of Second Temple Judaism, from Christianity's earliest days, Christians accepted non-Jews (Gentiles) without requiring them to fully adopt Jewish customs (such as circumcision). [Acts 10-15] The parallels in the Jewish faith are the Proselytes, Godfearers, and Noahide Law, see also Biblical law in Christianity. Some think that conflict with Jewish religious authorities quickly led to the expulsion of the Christians from the synagogues in Jerusalem (see also Council of Jamnia and List of events in early Christianity). The Church gradually spread throughout the Roman Empire and beyond, gaining major establishments in cities such as Jerusalem, Antioch, and Edessa. It also became a widely persecuted religion. It was condemned by the Jewish authorities as a heresy (see also Rejection of Jesus). The Roman authorities persecuted it because, like Judaism, its monotheistic teachings were fundamentally foreign to the polytheistic traditions of the ancient world and a challenge to the imperial cult. The Church grew rapidly until finally legalized and then promoted by Emperors Constantine and Theodosius I in the 4th century as the state church of the Roman Empire. Already in the 2nd century, Christians denounced teachings that they saw as heresies, especially Gnosticism but also Montanism. Ignatius of Antioch at the beginning of that century and Irenaeus at the end saw union with the bishops as the test of correct Christian faith. After legalization of the Church in the 4th century, the debate between Arianism and Trinitarianism, with the emperors favouring now one side now the other, was a major controversy. In using the word ἐκκλησία (ekklēsia), early Christians were employing a term that, while it designated the assembly of a Greek city-state, in which only citizens could participate, was traditionally used by Greek-speaking Jews to speak of Israel, the people of God, and that appeared in the Septuagint in the sense of an assembly gathered for religious reasons, often for a liturgy; in that translation ἐκκλησία stood for the Hebrew word קהל (qahal), which however it also rendered as συναγωγή (synagōgē, "synagogue"), the two Greek words being largely synonymous until Christians distinguished them more clearly. The term ἐκκλησία appears in only two verses of the Gospels, in both cases in the Gospel of Matthew. When Jesus says to Simon Peter, "You are Peter, and on this rock I will build my church", the church is the community instituted by Christ, but in the other passage the church is the local community to which one belongs: "If he refuses to listen to them, tell it to the church." The term is used much more frequently in other parts of the New Testament, designating, as in the Gospel of Matthew, either an individual local community or all of them collectively. Even passages that do not use the term ἐκκλησία may refer to the church with other expressions, as in the first 14 chapters of the Epistle to the Romans, in which ἐκκλησία is totally absent but which repeatedly uses the cognate word κλήτοι (klētoi, "called"). The church may be referred to also through images traditionally employed in the Bible to speak of the people of God, such as the image of the vineyard used particularly in the Gospel of John. The New Testament never uses the adjectives "catholic" or "universal" with reference to the church, but does indicate that the local communities are one church, that Christians must always seek to be in concord, that the Gospel must extend to the ends of the earth and to all nations, that the church is open to all peoples and must not be divided, etc. Church Fathers like Ignatius of Antioch, Irenaeus, Tertullian and Cyprian held to the view that the Christian Church was a visible entity, not an invisible body of believers. An icon depicting Constantine I, accompanied by the bishops of the First Council of Nicaea (325), holding the Niceno–Constantinopolitan Creed of 381. On February 27, 380, the Roman Empire officially adopted the Trinitarian version of Christianity as the state church of the Roman Empire. Prior to this date, Constantius II (337-361) and Valens (364-378) had personally favored Arian or Semi-Arian forms of Christianity, but Valens' successor Theodosius I supported the Trinitarian doctrine as expounded in the Nicene Creed from the 1st Council of Nicea. On this date, Theodosius I decreed that only the followers of Trinitarian Christianity were entitled to be referred to as Catholic Christians, while all others were to be considered to be heretics, which was considered illegal. In 385, this new legal situation resulted, in the first case of many to come, in the capital punishment of a heretic, namely Priscillian, condemned to death, with several of his followers, by a civil tribunal for the crime of magic. In the centuries of state-sponsored Christianity that followed, pagans and "heretical" Christians were routinely persecuted by the Empire and the many kingdoms and countries that later occupied the place of the Empire, but some Germanic tribes remained Arian well into the Middle Ages (see also Christendom). The Church within the Roman Empire was organized under metropolitan sees, with five rising to particular prominence and forming the basis for the Pentarchy proposed by Justinian I. Of these five, one was in the West (Rome) and the rest in the East (Constantinople, Jerusalem, Antioch, and Alexandria). Founded in 363 AD, Mar Mattai monastery, a Nestorian Church, is recognized as one of the oldest Christian monasteries in existence. Even after the split of the Roman Empire the Church remained a relatively united institution (apart from Oriental Orthodoxy and some other groups which separated from the rest of the Church earlier). The Church came to be a central and defining institution of the Empire, especially in the East or Byzantine Empire, where Constantinople came to be seen as the center of the Christian world, owing in great part to its economic and political power. Once the Western Empire fell to Germanic incursions in the 5th century, the (Roman) Church became for centuries the primary link to Roman civilization for medieval Western Europe and an important channel of influence in the West for the Eastern Roman, or Byzantine, emperors. While, in the West, the so-called orthodox Church competed against the Arian Christian and pagan faiths of the Germanic rulers and spread outside what had been the Empire to Ireland, Germany, Scandinavia, and the western Slavs, in the East Christianity spread to the Slavs in what is now Russia, south-central and eastern Europe. The reign of Charlemagne in Western Europe is particularly noted for bringing the last major Western Arian tribes into communion with Rome, in part through conquest and forced conversion. Starting in the 7th century the Islamic Caliphates rose and gradually began to conquer larger and larger areas of the Christian world. Excepting North Africa and most of Spain, northern and western Europe escaped largely unscathed by Islamic expansion, in great part because richer Constantinople and its empire acted as a magnet for the onslaught. The challenge presented by the Muslims would help to solidify the religious identity of eastern Christians even as it gradually weakened the Eastern Empire. Even in the Muslim World, the Church survived (e.g., the modern Copts, Maronites, and others) albeit at times with great difficulty. Although there had long been frictions between the Bishop of Rome (e.g. the patriarch of the Catholic Church proper) and the eastern patriarchs within the Byzantine Empire, Rome's changing allegiance from Constantinople to the Frankish king Charlemagne set the Church on a course towards separation. The political and theological divisions would grow until Rome and the East excommunicated each other in the 11th century, ultimately leading to the division of the Church into the Western (Catholic) and Eastern (Eastern Orthodox) Churches. In 1448, not long before the Byzantine Empire collapsed, the Russian Church gained independence from the Patriarch of Constantinople. As a result of the redevelopment of Western Europe, and the gradual fall of the Eastern Roman Empire to the Arabs and Turks (helped by warfare against Eastern Christians), the final Fall of Constantinople in 1453 resulted in Eastern scholars fleeing the Moslem hordes bringing ancient manuscripts to the West, which was a factor in the beginning of the period of the Western Renaissance there. Rome was seen by the Western Church as Christianity's heartland. Some Eastern churches even broke with Eastern Orthodoxy and entered into communion with Rome (the "Uniate" Eastern Catholic Churches). The changes brought on by the Renaissance eventually led to the Protestant Reformation during which the Protestant Lutheran and the Reformed followers of Calvin, Hus, Zwingli, Melancthon, Knox, and others split from the Catholic Church. At this time, a series of non-theological disputes also led to the English Reformation which led to the independence of the Church of England. Then, during the Age of Exploration and the Age of Imperialism, Western Europe spread the Catholic Church and the Protestant and Reformed churches around the world, especially in the Americas. These developments in turn have led to Christianity being the largest religion in the world today. A 2007 declaration of the Congregation for the Doctrine of the Faith clarified that, in this passage, "'subsistence' means this perduring, historical continuity and the permanence of all the elements instituted by Christ in the Catholic Church, in which the Church of Christ is concretely found on this earth", and acknowledged that grace can be operative within religious communities separated from the Catholic Church due to some "elements of sanctification and truth" within them, but also added "Nevertheless, the word 'subsists' can only be attributed to the Catholic Church alone precisely because it refers to the mark of unity that we profess in the symbols of the faith (I believe... in the 'one' Church); and this 'one' Church subsists in the Catholic Church." The Catholic Church teaches that only corporate bodies of Christians led by bishops with valid holy orders can be recognized as "churches" in the proper sense. In Catholic documents, communities without such bishops are formally called ecclesial communities. 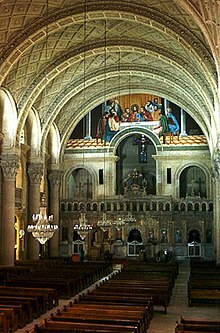 St. Mark's Coptic Orthodox Cathedral in Alexandria, Egypt. The term orthodox is generally used to distinguish the faith or beliefs of the "true Church" from other doctrines which disagree, traditionally referred to as heresy. The Eastern Orthodox Church and Oriental Orthodox Church each claim to be the original Christian Church. The Eastern Orthodox Church bases its claim primarily on its assertion that it holds to traditions and beliefs of the original Christian Church. It also states that four out of the five sees of the Pentarchy (excluding Rome) are still a part of it. The Oriental Orthodox churches' claims are similar to those of the Eastern Orthodox Church. They never adopted the theory of the Nature of God, which was formulated later than the break that followed the Council of Chalcedon. This concept of "orthodoxy" began to take on particular significance during the reign of the Roman Emperor Constantine I, the first to actively promote Christianity. Constantine convened the first Ecumenical Council, the Council of Nicea, which attempted to provide the first universal creed of the Christian faith. The major issue of this and other councils during the 4th century was the christological debate between Arianism and Trinitarianism. Trinitarianism is the official doctrine of the Catholic Church and is strongly associated with the term "orthodoxy", although some modern non-trinitarian churches dispute this usage. The Lutheran Churches traditionally hold that their tradition represents the true visible Church. The Augsburg Confession found within the Book of Concord, a compendium of belief of the Lutheran Churches, teaches that "the faith as confessed by Luther and his followers is nothing new, but the true catholic faith, and that their churches represent the true catholic or universal church". When the Lutherans presented the Augsburg Confession to Charles V, Holy Roman Emperor in 1530, they believe to have "showed that each article of faith and practice was true first of all to Holy Scripture, and then also to the teaching of the church fathers and the councils". Nevertheless, the Lutheran Churches teach that "there are indeed true Christians in other Churches" as "other denominations also preach the Word of God, though mixed with error"; since the proclamation of the Word of God bears fruit, Lutheran theology accepts the appellation "Church" for other Christian denominations. Anglicans generally understand their tradition as a branch of the historical "Catholic Church" and as a via media ("middle way") between traditions, often Lutheranism and Reformed Christianity, or Roman Catholicism and Reformed Christianity. Reformed theology defines the Church as being invisible and visible--the former includes the entire communion of saints and the latter is the "institution that God provides as an agency for God's saving, justifying, and sustaining activity", which John Calvin referred to as "our mother". The Reformed confessions of faith emphasize "the pure teaching of the gospel (pura doctrina evangelii) and the right administration of the sacraments (recta administratio sacramentorum)" as "the two most necessary signs of the true visible church". Methodist preachers are known for promulgating the doctrines of the new birth and entire sanctification to the public at events such as tent revivals and camp meetings, which they believe is the reason that God raised them up into existence. Methodists affirm belief in "the one true Church, Apostolic and Universal", viewing their Churches as constituting a "privileged branch of this true church". With regard to the position of Methodism within Christendom, the founder of the movement "John Wesley once noted that what God had achieved in the development of Methodism was no mere human endeavor but the work of God. As such it would be preserved by God so long as history remained." Calling it "the grand depositum" of the Methodist faith, Wesley specifically taught that the propagation of the doctrine of entire sanctification was the reason that God raised up the Methodists in the world. The term "orthodoxy" or "orthodox faith", with a lower-case O and thus distinguished from the term Orthodox Church, have been used to distinguish the "true church" from supposedly heretical groups. The term became especially prominent in referring to the doctrine of the Nicene Creed and, in historical contexts, is often still used to distinguish this first "official" doctrine from others. The "Body of Christ" (cf. 1Cor 12:27) and "Bride of Christ" (cf. Rev 21:9; Eph 5:22-33). These terms are used to refer to the whole community of Christians seen as interdependent in a single entity headed by Jesus Christ. The terms "Churches Militant, Penitent, and Triumphant" (Latin: Ecclesia Militans and Ecclesia Triumphans), taken together, are used to express the concept of a united Church that extends beyond the earthly realm into Heaven. The term Church Militant comprises all living Christians while Church Triumphant comprises those in Heaven. Related is the "Church Suffering" or "Church Expectant", a Catholic concept encompassing those Christians in Purgatory, no longer part of the Church Militant and not yet part of the Church Triumphant. The communion of saints (Latin: communio sanctorum) is the spiritual union of the members of the Christian Church, living and the dead. It is a union in faith and prayer that binds all Christians regardless of geographical distance or separation by death. In Catholic theology, this union encompasses the Church Militant, the Church Triumphant, and the Church Suffering. "Apostolic succession" is a doctrine of the Catholic Church, the Eastern Orthodox Churches, the Oriental Orthodox churches, the Moravian Church, the Scandinavian Lutheran Churches, Anglican Communion, and others. The doctrine asserts that the bishops of the "true Church" enjoy the favor or grace of God as a result of legitimate and unbroken sacramental succession from Jesus' apostles. According to this doctrine, modern bishops, therefore, must be viewed as part of an unbroken line of leadership in succession from the original apostles: though they do not have the authority and powers granted uniquely to the apostles, they are the apostles' successors in governing the Church. Other protestants see the authority given to the apostles as unique, proper to the apostles alone, to the extent that they generally reject the idea of a succession of bishops to the apostles in governing the Church. Their view of ecclesiastical authority is accordingly different. The phrase "One, holy, catholic, and apostolic Church" appears in the Nicene Creed (μίαν, ἁγίαν, καθολικὴν καὶ ἀποστολικὴν Ἐκκλησίαν) and, in part, in the Apostles' Creed ("the holy catholic church", sanctam Ecclesiam catholicam, which in Greek would be: ἁγίαν καθολικὴν Ἐκκλησίαν). The phrase is intended to set forth the four marks, or identifying signs, of the Christian Church—unity, holiness, universality, and apostolicity—and is based on the premise that all true Christians form a single united group founded by the apostles. The word "catholic" is derived from the Greek adjective καθολικός pronounced katholikos, which means "general" or "universal". Applied to the Church, it implies a calling to spread the faith throughout the whole world and to all ages. It is also thought of as implying that the Church is endowed with all the means of salvation for its members. In this sense the Church is taken by Christian theology to refer to the single, universal community of faithful. Baptism and communion signifies membership of the Church. Excommunication is expulsion from the visible community of the Church, and is a remedial denial of the sacraments to a baptized Christian that does not invalidate that Christian's baptism. This can be traced back to the New Testament and to Jesus himself: Matthew 18:15-18, Matthew 16:18-19, Acts 8:18-24, Galatians 1:6-9, 2 Thessalonians 3:6-15, 1 Corinthians 5, 2 Corinthians 2:5-8, 1 Timothy 1:18-20, Titus 3:10, 3 John 9-11, Jude 8-23, John 15:6, 1 Corinthians 5:5. Saint Ignatius of Antioch, the earliest known writer to use the phrase "the catholic church", excluded from the Church heterodox groups whose teaching and practice conflicted with those of the bishops of the Church, and considered that they were not really Christians. In keeping with this idea, many churches and communions consider that those whom they judge to be in a state of heresy or schism from their church or communion are not part of the catholic Church. This is the view of the Catholic, Oriental Orthodox, and Eastern Orthodox churches. St. Peter's Basilica in Vatican City, the largest church building in the world today. The Eastern Orthodox Church, the Oriental Orthodox Church, and the Catholic Church each regard themselves as the one true and unique church of Christ, and claim to be not just a Christian church but the original church founded by Christ, preserving unbroken the original teaching and sacraments. The Catholic Church teaches that "the one Church of Christ, as a society constituted and organized in the world, subsists in the Catholic Church, governed by the Successor of Peter and the bishops in communion with him. Only through this Church can one obtain the fullness of the means of salvation since the Lord has entrusted all the blessings of the New Covenant to the apostolic college alone whose head is Peter." Similarly, the Eastern Orthodox Church believes it is "the One Holy Catholic and Apostolic Church, founded by Jesus Christ and His apostles. It is organically and historically the same Church that came fully into being at Pentecost." They see the members of other churches as linked in only an imperfect way with the one true Church, recognising Protestants not as churches but as ecclesial or specific faith believing communities. Historically, Catholics would label members of certain Christian churches (also certain non-Christian religions) by the names of their founders, either actual or purported. Such supposed founders were referred to as heresiarchs. This was done even when the party thus labeled viewed itself as belonging to the one true church. This allowed the Catholic party to claim that the other church was founded by the founder, while the Catholic church was founded by Christ. This was done intentionally in order to "produce the appearance of the fragmentation within Christianity"–a problem which the Catholic side would then attempt to remedy on its own terms. Although Catholics reject Branch theory, Pope Benedict XVI and Pope John Paul II used the "two lungs" concept to relate Catholicism with Eastern Orthodoxy. However, it has a destructive effect on ecumenical relations if one church deprives another church of the right to be called a church. It is just as destructive as if one Christian denies another Christian the right to be called a Christian. Historically, Catholics would label members of certain Christian churches (also certain non-Christian religions) by the names of their founders, either actual or purported. Such supposed founders were referred to as heresiarchs. This was done even when the party thus labeled viewed itself as belonging to the one true church. This allowed the Catholic party to claim that the other church was founded by the founder, while the Catholic church was founded by Christ. This was done intentionally in order to "produce the appearance of the fragmentation within Christianity"–a problem which the Catholic side would then attempt to remedy on its own terms. The Augsburg Confession of the Lutheran Churches teach that "their churches represent the true catholic or universal church". It holds, however, that "there are indeed true Christians in other Churches" as "other denominations also preach the Word of God, though mixed with error". Many other Christian groups take the view that all denominations are part of a symbolic and global Christian church which is a body bound by a common faith if not a common administration or tradition. Like the Catholic Church, the Orthodox Church, and some others have always referred to themselves as the Catholic church. Oriental Orthodoxy shares this view, seeing the Churches of the Oriental Orthodox communion as constituting the one true Church. In the West the term Catholic has come to be most commonly associated with the Catholic Church because of its size and influence in the West, and because that is historically its name (although in formal contexts most other churches still reject this naming, because the title "Catholic Church" is so linked with the notion of being the one true church). Many Protestants believe that the Christian Church, as described in the Bible, has a twofold character that can be described as the visible and invisible church. In this view, the church invisible consists of all those from every time and place who are vitally united to Christ through regeneration and salvation and who will be eternally united to Jesus Christ in eternal life. The universal, invisible church refers to the "invisible" body of the elect who are known only to God, and contrasts with the "visible church"—that is, the institutional body on earth which preaches the gospel and administers the sacraments. Every member of the invisible church is considered saved, while the visible church contains some individuals who are saved and others who are unsaved.[comp. Mt. 7:21-24] This concept has been attributed to St Augustine of Hippo as part of his refutation of the Donatist sect, but others question whether Augustine really held to some form of an "invisible true Church" concept. Catholics and Eastern Orthodox see this dual ecclesiology as semi-Donatism and a deviation from historic teaching. The church visible, in this same view, consists of all those who visibly join themselves to a profession of faith and gathering together to know and serve the head of the church, Jesus Christ. It exists globally in all who identify themselves as Christians and locally in particular places where believers gather for the worship of God. The visible church may also refer to an association of particular churches from multiple locations who unite themselves under a common charter and set of governmental principles. The church in the visible sense is often governed by office-bearers carrying titles such as minister, pastor, teacher, elder, and deacon. 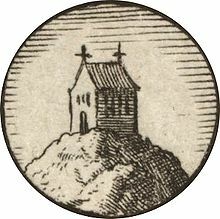 For the Catholic Church and the Eastern Orthodox Church, making a real distinction between "the heavenly and invisible Church, alone true and absolute" and "the earthly Church (or rather "the churches"), imperfect and relative" is a "Nestorian ecclesiology" and is thus deemed by both as heretical. An exclusively mystical understanding of the Church is mistaken as well, because a mystical "Christ in us" union would deify its members and mean that the acts of Christians are simultaneously the acts of Christ. The theological concept una mystica persona (one mystical person) refers not to an individual relation but to the unity of Christ with the Church and the unity of its members with him in her. Major forms of church government include episcopal governance (Anglican, Catholic, Eastern Orthodoxy, Oriental Orthodoxy), presbyterian governance, and congregational governance (Baptist, some Pentecostal, Congregationalist, charismatic, and other Protestant denominations). Before the Protestant Reformation, church leaders (the bishops) were universally understood to gain their authority through apostolic succession via the Sacrament of Ordination. Today there is a wide diversity of Christian groups, with a variety of different doctrines and traditions. These controversies between the various branches of Christianity naturally include significant differences in their respective ecclesiologies. A denomination in Christianity is a generic term for a distinct religious body identified by traits such as a common name, structure, leadership, or doctrine. Individual bodies, however, may use alternative terms to describe themselves, such as "church" or "fellowship". Divisions between one group and another are defined by doctrine and church authority; issues such as the nature of Jesus, the authority of apostolic succession, eschatology, and papal primacy often separate one denomination from another. Groups of denominations often sharing broadly similar beliefs, practices, and historical ties are known as branches of Christianity. Individual Christian groups vary widely in the degree to which they recognize one another. Several groups claim to be the direct and sole authentic successor the church founded by Jesus Christ in the 1st century AD. Others, however, believe in denominationalism, where some or all Christian groups are legitimate churches of the same religion regardless of their distinguishing labels, beliefs, and practices. Because of this concept, some Christian bodies reject the term "denomination" to describe themselves, to avoid implying equivalency with other churches or denominations. The Catholic Church and Eastern Orthodox Church believe that the term one in the Nicene Creed describes and prescribes a visible institutional and doctrinal unity, not only geographically throughout the world, but also historically throughout history. They see unity as one of the four marks that the Creed attributes to the genuine Church, and the essence of a mark is to be visible. A church whose identity and belief varied from country to country and from age to age would not be "one" in their estimation. As such they see themselves not as a denomination, but as pre-denominational; not as one of many faith communities, but the original and sole true Church. Many Baptist and Congregationalist theologians accept the local sense as the only valid application of the term church. They strongly reject the notion of a universal (catholic) church. These denominations argue that all uses of the Greek word ekklesia in the New Testament are speaking of either a particular local group or of the notion of "church" in the abstract, and never of a single, worldwide church. Many Anglicans, Lutherans, Old Catholics, and Independent Catholics view unity as a mark of catholicity, but see the institutional unity of the Catholic Church as manifested in the shared apostolic succession of their episcopacies, rather than a shared episcopal hierarchy or rites. Reformed Christians hold that every person justified by faith in the Gospel committed to the Apostles is a member of "One, holy, catholic, and apostolic Church". From this perspective, the real unity and holiness of the whole church established through the Apostles is yet to be revealed; and meanwhile, the extent and peace of the church on earth is imperfectly realized in a visible way. The Lutheran Church–Missouri Synod declares that only believers in the doctrine of justification are members of the Christian Church, excluding all others, even if those others are in external communion with the Church and even if they hold a teaching office in it. A number of historians have noted a twentieth-century "global shift" in Christianity, from a religion largely found in Europe and the Americas to one which is found in the global south. Described as "World Christianity" or "Global Christianity," this term attempts to convey the global nature of the Christian religion. However, the term often focuses on “non-Western Christianity” which “comprises (usually the exotic) instances of Christian faith in ‘the global South’, in Asia, Africa and Latin America.” It also includes indigenous or diasporic forms in Western Europe and North America. "Churchianity" is a pejorative term for practices of Christianity that are viewed as placing more emphasis on the habits of church life or its institutional traditions than on the teachings of Jesus. Hence the replacement of "Christ" by "Church" in the word "Churchianity". Some Protestants apply it to churches that they view as having moved the central focus from Christ to the Church. Others, such as the Orthodox Church and the Catholic Church, see Christ as the centre, but the Church also as essential (extra Ecclesiam nulla salus) because of the close union between Christ and the Church described in Biblical passages such as the Epistle to the Ephesians (see Bride of Christ), and they view the worship and piety of certain Protestants as centred on celebrity pastors and factions rather than on Christ. There are many opinions as to the ultimate fate of the souls of individuals who are not part of a particular institutional church, i.e., members of a particular church may or may not believe that the souls of those outside their church organization can or will be saved. There have always been differing opinions as to the divinity of God, the Son or his unity with God, the Father. Although, historically, the most significant debate in this arena was the Arianism and trinitarianism debate in the Roman Empire, debates in this realm have occurred throughout Christian history. It has been debated in Protestantism whether or not the Christian Church is in fact a unified heavenly institution with the earthly institutions relegated to secondary status. ^ "Ekklesia: A Word Study". Acu.edu. Archived from the original on 3 September 2006. Retrieved 3 September 2013. ^ Harper, Douglas (2001). "church". Online Etymology Dictionary. Retrieved 2008-01-18. O.E. cirice "church," from W.Gmc. *kirika, from Gk. kyriake (oikia) "Lord's (house)," from kyrios "ruler, lord." ^ Harper, Douglas (2001). "church". Online Etymology Dictionary. Retrieved 2008-01-18. Gk. kyriakon (adj.) "of the Lord" was used of houses of Christian worship since c. 300, especially in the East, though it was less common in this sense than ekklesia or basilike. ^ The Editors of Encyclopædia Britannica. "Pentecost | Christianity". Encyclopædia Britannica. Retrieved 4 November 2016. ^ "Religions - Christianity: Pentecost". bbc.co.uk. British Broadcasting Corporation (BBC). Retrieved 4 November 2016. ^ Milavec, Aaron (2007). Salvation is from the Jews (John 4:22): Saving Grace in Judaism and Messianic Hope in Christianity. Liturgical Press. p. 90. ISBN 9780814659892. Retrieved 4 November 2016. ^ "Pentecost (Whitsunday)". Catholic Encyclopedia. Accessed on 4 November 2016. Herbermann, Charles, ed. (1913). "Acts of the Apostles" . Catholic Encyclopedia. New York: Robert Appleton Company. ^ a b Xavier Léon-Dufour (editor), Vocabulaire de théologie biblique (Paris, Cerf, 1981 ISBN 2-204-01720-5), pp. 323-335. ^ Halsall, Paul (June 1997). "Theodosian Code XVI.i.2". Medieval Sourcebook: Banning of Other Religions. Fordham University. Retrieved 2006-11-23. Healy, Patrick (1913). "Priscillianism" . In Herbermann, Charles. Catholic Encyclopedia. New York: Robert Appleton Company. ^ Moosa, Matti (28 April 2012). "The Christians Under Turkish Rule". ^ MSN Encarta: Orthodox Church, retrieved May 12, 2007. Archived from the original on 2009-10-31. ^ In The Catholicity of the Church, p. 132, Avery Dulles noted that this document avoided explicitly calling the Church the "Roman" Catholic Church, replacing this term with the equivalent "which is governed by the successor of Peter and by the Bishops in communion with him" and giving in a footnote a reference to two earlier documents in which the word "Roman" is used explicitly. ^ Catholic Book of Prayers, Pg. 236, Large-Print Edition; Nihil Obstat and Impramatur. 2005 copyright. Catholic Book Publishing Corp., New Jersey. ^ a b c Frey, H. (1918). Is One Church as Good as Another?. 37. The Lutheran Witness. pp. 82–83. ^ Anglican and Episcopal History. Historical Society of the Episcopal Church. 2003. p. 15. Others had made similar observations, Patrick McGrath commenting that the Church of England was not a middle way between Roman Catholic and Protestant, but "between different forms of Protestantism," and William Monter describing the Church of England as "a unique style of Protestantism, a via media between the Reformed and Lutheran traditions." MacCulloch has described Cranmer as seeking a middle way between Zurich and Wittenberg but elsewhere remarks that the Church of England was "nearer Zurich and Geneva than Wittenberg. ^ McKim, Donald K. (1 January 2001). The Westminster Handbook to Reformed Theology. Westminster John Knox Press. p. 34. ISBN 9780664224301. ^ Adhinarta, Yuzo (14 June 2012). The Doctrine of the Holy Spirit in the Major Reformed Confessions and Catechisms of the Sixteenth and Seventeenth Centuries. Langham Monographs. p. 83. ISBN 9781907713286. ^ a b Gibson, James. "Wesleyan Heritage Series: Entire Sanctification". South Georgia Confessing Association. Retrieved 30 May 2018. ^ Bloom, Linda (20 July 2007). "Vatican stance "nothing new" say church leader". The United Methodist Church. Retrieved 10 June 2018. ^ William J. Abraham (25 August 2016). "The Birth Pangs of United Methodism as a Unique, Global, Orthodox Denomination". Retrieved 30 April 2017. ^ Davies, Rupert E.; George, A. Raymond; Rupp, Gordon (14 June 2017). A History of the Methodist Church in Great Britain, Volume Three. Wipf & Stock Publishers. p. 225. ISBN 9781532630507. ^ "communion of saints", Encyclopædia Britannica. ^ Guidry, Christopher R.; Crossing, Peter F. (1 January 2001). World Christian Trends, AD 30-AD 2200: Interpreting the Annual Christian Megacensus. William Carey Library. p. 307. ISBN 9780878086085. A number of large episcopal churches (e.g. United Methodist Church, USA) have maintained a succession over 200 years but are not concerned to claim that the succession goes back in unbroken line to the time of the first Apostles. Very many other major episcopal churches, however-Roman Catholic, Orthodox, Old Catholic, Anglican, Scandinavian Lutheran-do make this claim and contend that a bishop cannot have regular or valid orders unless he has been consecrated in this apostolic succession. ^ a b Apostolic Succession, The Columbia Encyclopedia, Sixth Edition. 2001-07. ^ "Successors of the Apostles". Archived from the original on 2009-05-23. Retrieved 2009-05-30. ^ Note that it does not say, "Only through this Church can one obtain salvation"—it says, "Only through this Church can one obtain the fullness of the means of salvation", i.e., all the "helps" individual believers need to nurture, protect, cultivate, and grow to fruitful maturity the gift of salvation that has been given to them. —see Matthew 25:13-30, John 15:4-8, Acts 2:42, Romans 12:4-8, 1 Corinthians 1:10, 1 Cor. 12:7, 1 Cor. 12:20-21, 1 Cor. 12:25-28, 1 Cor. 14:12, 1 Cor. 14:26-33, Ephesians 2:19-22, Revelation 21:14, Ephesians 4:4-16, Philippians 2:12-15, Colossians 2:18-19, Hebrews 6:4-12, Hebrews 10:25, Heb. 13:17, 1 Peter 2:2-3, 2 Peter 3:9-18, Revelation 21:22-27, Rev. 21:6-8, Rev. 22:14-15. ^ "The expression sister Churches in the proper sense, as attested by the common Tradition of East and West, may only be used for those ecclesial communities that have preserved a valid Episcopate and Eucharist" (Note on the expression "sister Churches") Archived April 1, 2015, at the Wayback Machine. ^ Robert G. Stephanopoulos. "The Greek (Eastern) Orthodox Church in America". www.goarch.org. Greek Orthodox Archdiocese of America. Retrieved 2007-08-01. ^ Andrew F. Walls (1996). Missionary Movement in Christian History: Studies in the Transmission of Faith. Orbis Books. ISBN 978-1-60833-106-2. ^ Robert, Dana L. (April 2000). "Shifting Southward: Global Christianity Since 1945" (PDF). International Bulletin of Missionary Research. 24 (2): 50–58. ^ Jenkins, Philip (2011). The Next Christendom: The Coming of Global Christianity. New York: Oxford University Press. ISBN 9780199767465. ^ Kim, Sebastian; Kim, Kirsteen (2008). Christianity as a World Religion. London: Continuum. p. 2. ^ Jehu Hanciles (2008). Beyond Christendom: Globalization, African Migration, and the Transformation of the West. Orbis Books. ISBN 978-1-60833-103-1. Orthodox Church, MSN Encarta, retrieved May 10, 2007 Orthodox Church - MSN Encarta. Archived from the original on 2009-10-31. Herbermann, Charles, ed. (1913). "Unity (as a Mark of the Church)" . Catholic Encyclopedia. New York: Robert Appleton Company. Apostolic Succession, The Columbia Encyclopedia, Sixth Edition. 2001-05. Bannerman, James, The Church of Christ: A treatise on the nature, powers, ordinances, discipline and government of the Christian Church', Still Waters Revival Books, Edmonton, Reprint Edition May 1991, First Edition 1869. Grudem, Wayne, Systematic Theology: An Introduction to Biblical Doctrine, Inter-Varsity Press, Leicester, England, 1994. Look up Churchianity in Wiktionary, the free dictionary.